It is going well in Lebanon, for everybody: Lebanese, Palestinian and Syrian refugees, Armenian Immigrants, Christians, and Muslims. Being happy in the Middle East with no war is the best thing that could happen to that area’s citizens, especially for the Palestinian refugees who are the second and third generations of people who escaped “the Catastrophe” in 1948. It was Wednesday, an early release day from schools. Everybody was happy to spend the extra time with their families. One of those families living in the Borj Al-Chamali, a Palestinian Refugee Camp in Tyre, Lebanon, decided to go on a picnic to a park close to the Palestinian-Lebanese border called Maroon Al-Ras Park. It is a beautiful family park where Palestinian and Lebanese families barbeque meat and eat falafel and hummus, appreciating their national dishes. This family had a five-year-old child. With his early release day, he was probably thinking, “Oh, I am going to eat some delicious food in the park with my family, and look at my beautiful, occupied country through the barbed wire…”. 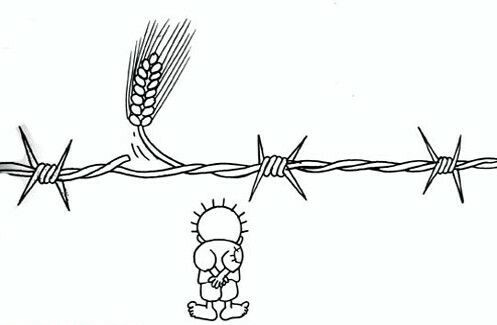 Little did he know that the Israeli army would only let him look at it for a short while because when he did peek at it through the barbed wire, he got shot bullets as many as the years he had lived. With his mom crying and his dad angry and his brothers and sisters shocked and scared, they wanted to do something but there was nothing possible, so they started throwing stones. But after a minute of, the angry stone-throwing father, mother, and siblings were sniped too. In front of the depressing barbed wire, the number of victims was now 7. The people in their camp knew about the occurrence and decided to go to the barbed wire as regiments with Kalashnikovs and shotguns and some of them merely with stones in their hand. But none of them could reach any of the Israeli soldiers with their arms, but the latter could kill approximately a hundred of the refugees. This wasn’t enough for the Israeli army. They wanted more, and entered Lebanon by sea, going to the camp of the family but there was no way to reach the camp without exposing other Lebanese areas to conflict and catastrophe. And out of nowhere, Al-Rashidieh camp, the closest camp to the border that, lying two minutes from the Mediterranean sea was attacked by the forces and blocked from all directions. All schools and organizations closed, all families were frightened till tears. It was the same scenario as the July 2006 war, the difference was only that the opponent fought the camp, not the entire country. Only the camp was in danger. Nobody was able to exit the house even to escape. The situation was horrible, the only food people could access was what they had in the fridge. None of the camp’s internal shops were open for people to buy new food. Kids wanting to go out and play, but they couldn’t; none of them understanding what was happening outside. My own brother was one of them. This war is just a waste of their childhood. It was calm for two days, nothing happened. It was only a siege. My parents thought it would be one of the blockades, scaring the Palestinians and after an amount of time, it is over as if it had never happened. It was a fearful situation with nothing happening. My parents were calming me, telling me how ridiculous and fearful it was and how short it was going to be. But all these statements changed on Friday evening when a bombing happened in my neighborhood and the whole neighborhood died as martyrs. Even my very own neighbors, the ones whose kids I would play with in my younger years died, all eight of them: the parents, their five kids, and their 69-year old grandmother. All these people died innocently. But my family were lucky. The bombing was a whole 10-20 centimeters far from my house. Had it not been like that, I would have listened to my family’s news that day. My parents called me 20 minutes later asking me for solutions and things to do to protect themselves. They might have been the next goal. I told them to move through the land if it was open and to reach my aunt’s house in Beirut where they would be safer. Refugees in my area were frightened. Their life was threatened. All of them started leaving the camp. My parents were panicking, my brother in Cyprus wanted to return, but my parents urged him not to. My little brother didn’t know what is happening, he was asking dad, “What happened? Baba?”. There was nothing to do but to lie to him, telling him that, “Allah loves our neighbors so much that he had to carry them with their houses to paradise”. Wissam asked, “Is he going to send them back?”, and my dad replied: “People who go there never come back because it is better to stay there!”. My family fled the camp. And from that time till now I heard nothing about anything happening, but all I know is that the forces are still there and the camp is empty as people have left to their relatives’ houses. Let Allah be with them and protect them from any danger and injustice. Because the only thing we refugees and boarding students can do for our families is, to “Pray for them”.